After the hugely successful free MMORPG Runes of Magic, Runewaker is finally back with another game. Once again a fantasy MMO game, Dragon’s Prophet takes a different approach nonetheless and pushes those fantastic mythical creatures, dragons, to the limelight. 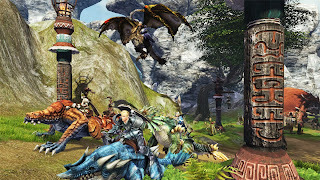 The player will explore the vast and beautiful land of Auratia and search for over 300 different types of dragons to battle, tame, ride and fight with. Each dragon has its own look and abilities for you to use. The varied landscape has dragons all over the place, from land to sea and air. Taming them isn’t an easy task but it will show other players your ability. Dragon’s Prophet includes other features to keep players invested in this game, one of the most anticipated free MMO games of 2013, such as a housing system that will turn small villages into impressive cities.